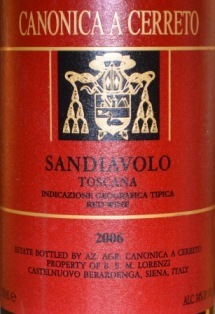 A perfect blend of 34% Sangiovese, 33% Cabernet Sauvignon and 33% Merlot. And it’s awesome for a Super Tuscans at the moment, particularly those that fall into that $20-$30 range where you can find some real gems. A major score for $23.99. You will get more of a Sangiovese/Chianti feel early on with this wine. The nose and the minute you hold the glass up for a drink, you think you’re getting a good Chianti (and that’s expected, since the vineyard is in the hills surrounding Chianti Classico), but then mid-drink to finish, the flavor rounds out, a little more red cherry surfaces, and the body and finesse of the blend really take hold. It was an exceptional wine from start to finish. It’s drinking perfectly right now, and should mention that it’s got a little pepper/spice throughout. Strong buy.